I am about to tell you all of the things that happen in this comic! Also, be sure to read it! This run is very good! One of the things I like most about this run so far is that G. Willow Wilson didn’t come to play. Yeah, she’s got rad action and some enjoyable comedy and all of the things that make a superhero comic entertaining. But beyond that, she is digging into some heavy stuff. The word I keep coming back to when I review her issues is “interrogation.” The first arc with Ares was an interrogation of what it means to be a hero, and whether answering violence with violence is just perpetuating a damaging system. It was an arc that didn’t land on any firm answer, and it feels like we’re picking up on that theme again here, but with a slight, more specific alteration. Now we’re interrogating what it means to be a superhero. With the realization that the rock giants aren’t sentient, Wonder Woman doesn’t need to hold back anymore. She can push her strength and her powers further, full on demolishing the creatures without fear of killing someone. And Giganta notices, because Giganta is smart. 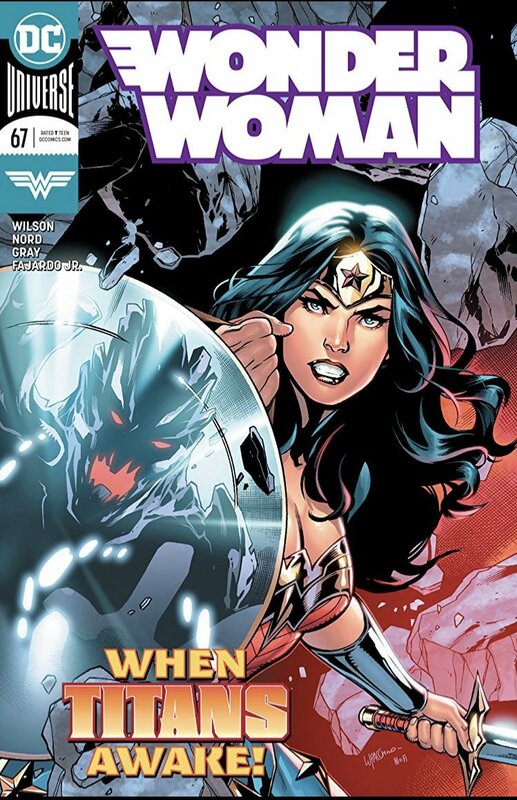 She’s seen through Wonder Woman from day one, noting the deeper motivations behind her actions. And now she’s got some thoughts. Namely, that Wonder Woman is scared of her own powers, and that if she wanted to she could use her powers to run the world. And, more incisively, in that holding back to supposedly protect the weak, Wonder Woman is lying to herself. 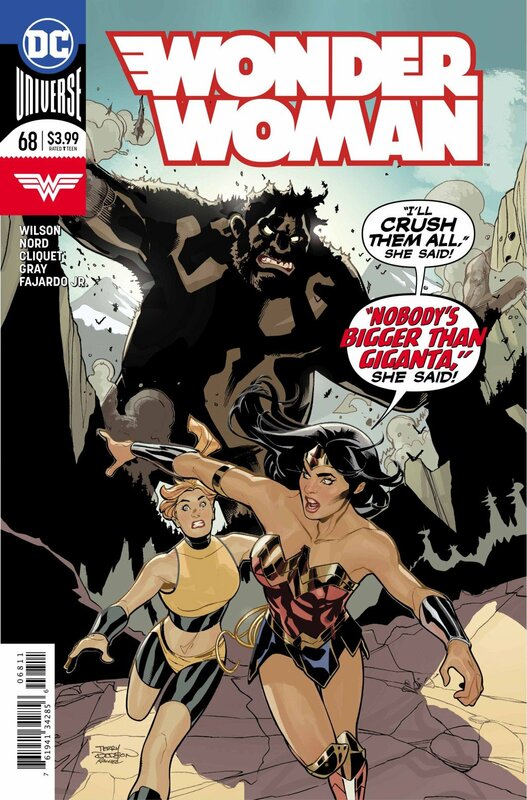 Giganta suggests that Wonder Woman’s morality is a smoke screen to hide from her fear of herself, of what she could be if she embraced the depths of her powers. Wonder Woman disagrees, of course, but it’s clear that she’s a bit rattled. The comments resonate with her on some level. Now, Giganta is hardly trustworthy here. Like Ares and Veronica Cale before her, Giganta is not someone with Wonder Woman’s best interests at heart. This is hardly a critique that is meant to encourage Wonder Woman to be her best self. If anything, it’s a reflection of Giganta’s own sense of powerlessness, of her yearning for what she could do with more power. Being in the Suicide Squad can’t be terribly fun, and seeing someone free yet holding back what they can do must be irksome to her. And yet, Giganta gets to the heart of things in a way no one else has yet. Ares is all bluster and bloviating. Veronica Cale is all anger and blame. They don’t see Diana for who she is. Giganta does, though, in her own way. When Wonder Woman insists that her morality is not fake, Giganta replies, “Oh yeah? Then why aren’t you happy?” The line made me stop for a second, in part because it was very unexpected but also because it rang surprisingly true. Yeah, Diana’s got Steve and her friends and a swell gig saving the world, but there hasn’t been a lot of joy to this run. Even beyond the drama surrounding the Amazons, there’s a dearth of happiness. She’s not unhappy, really. It’s sort of a neutral. She’s purposeful in her actions, staying true to her beliefs and what makes her who she is. There’s just no buoyancy to it. Not to go all Marie Kondo on her, but Diana’s life doesn’t seem to be sparking a lot of joy for her right now. What that means for her, I have no idea. And again, Giganta’s most definitely not trying to help Wonder Woman here. This may not be an observation Diana needs to take to heart. I thought it resonated, though, and I’m curious to see how it plays out. The finding of Antiope’s sword seems to have lifted Diana’s spirits, and we’ve got a fun new quest ahead of us now. But Giganta’s comments run deeper than the Amazon issue. Diana doesn’t need to find her family so much as she needs to find herself. And maybe finding her family is a necessary step on that journey. We’ve got Cary Nord and Mick Gray back on art to start out the issue, but just when I was getting into their style and starting to enjoy their work, we only get them for half the book. Ronan Cliquet takes over in the second half, and his work is generally unremarkable. If he’s trying to do a Cary Nord impression, he’s not great at it. And what we end up with is run of the mill superhero fare. We’ve got Xermanico back in two weeks, however, and he was great last time around. Also, a fun team up with a triumvirate of awesome ladies! There’s Wonder Woman leading the charge, Aphrodite and her cool swan, and Maggie with Antiope’s sword atop the pegasus Cadmus. They look super cool, and I can’t wait to see what kind of adventure they’re about to get into. Plus, Antiope’s got to show up sometime soon now! You can’t give us her sword and then no Antiope. She’s not been a huge part of Wonder Woman comics in the past, and I’m excited to see how G. Willow Wilson and the art team bring her to life in the wake of Robin Wright’s spectacular take on the character in the Wonder Woman movie. Should be fun! This issue was everything I wanted it to be. Fun banter between Wonder Woman and Giganta? Yes. Busting up rock giants in awesome fight scenes? Yes. Enemies becoming friends as they worked together toward a common purpose? YES. It was all such a good time, epic in scope yet intimate in terms of its subtle relationship building. Road trips with Wonder Woman should be a thing from now on. Like a requirement for every run. Have her team up with one of her foes against a bigger foe, go off on an adventure, and before you know it they’re pals sharing a meal at a diner in Colorado. Make it a thing, DC! It doesn’t have to be rock monsters or Colorado every time either. Though the rock monsters were cool. Big things that Wonder Woman and her pals can beat on make for enjoyable comic books. Look away if you have not read this excellent issue! It’s a delight, and you should go in unspoiled! Invest your $3.99 in a good time! So, the titans are a big problem. Or rather, not the titans? As Wonder Woman observes by the issue’s end, they’re not acting like gods, or even properly sentient beings. They certainly don’t have the faculties one would expect from the world’s original deities. Something else seems to be happening, something involving the sword that Maggie finds in the lake. Which I loved. Any time a story veers into lady + lake + sword, things are going right up my alley. I’m all about Arthurian lore, and I’m curious to see how much G. Willow Wilson is steering into it here. I suspect not too much, since we’ve got enough going on with the Olympians all cast down to Earth. But a little taste and a touch of borrowed iconography could definitely be a nice additional to this already great storyline. But the sword wasn’t the focus of this issue. We’ll get into that in two weeks time. This week was about friendship! And it came together in a very cool way. The last issue was all about setting the parameters. Giganta was up front about her desire not to be friends, and Diana said that’s not why she brought her (though we all know it was, even if Diana doesn’t fully realize it). It was discussed directly and, apart from a nice moment at the end of the book, Giganta was adamant they were not going to become pals. What I especially liked about this issue is that they don’t really talk about being friends. It just sort of happens through what they’re experiencing together and by the end they’ve developed a degree of trust and camaraderie that can’t help but bring them closer together. Things start off with Giganta still a bit snarky, being sarcastic about their situation and making fun of Diana’s attempts at humour. Then the fights start, and things quickly get out of hand, as battles with rock giants are wont to do. Giganta is a valiant warrior, but she can’t handle the rock giant alone. And when she needs help, Diana is there, instantly and with all her might, even if she is tiny and little more than an annoyance to these massive creatures. Between the lines of all of this is where their relationship starts to grow. By working together they begin to trust each other, especially on Giganta’s end. She knows she’s there to be the muscle, since she’s the only one big enough to have any effect against the rock giants. And yet, Diana is there alongside her, totally outclassed but rushing in nonetheless to help her out and buy her the time she needs to get back into the fight. That’s how everyone makes friends, really. Not in rad fights against rock giants usually, but in that you meet someone with a common interest or goal and you have each other’s backs and learn to trust and appreciate each other. Another great thing about this issue is that I felt like the art was much improved from the last outing. Not that Cary Nord and Mick Gray did a bad job by any means two weeks back, but I felt like the art and the writing weren’t meshing together well. Nord just wasn’t capturing the spirit of the script, or adding much to help tell the story apart from the essentials. This issue felt much more engaged and connected. For one thing, his characters were expressive in a whole spectrum of ways. Last time, I had to get everything from the dialogue. The art wasn’t telling me much at all. This time, I could see what the scene felt like before I even got to the words. He was communicating the emotions of each moment very clearly. It’s not the clearest, most detailed panel ever, but it communicates so much. I know I’ve been down on Nord a lot during this run, but he and Gray really hit it out of the park with this issue. It’s the best we’ve seen of them so far, for sure. And of course, series MVP Romulo Fajardo Jr. makes it all just sing. That dude is the best in the biz. So in two weeks we’ve got the mystery of the sword to dig into! The rock giants are after it, so that could be a pickle for Maggie and the gang of Olympian creatures. And if it’s an Olympian sword of some sort, I’m wondering if it will give her special powers or abilities? That could be fun. We’ll see how it all unfolds! I’m a day late on my Wonder Woman review again. Making a movie is a lot of work, gang! There’s so much on the go. And incidentally, you can check out my short film’s Kickstarter if you want to learn more! But back to the book. When I was late to the party two weeks back, I wasn’t too sad about it. As much as I love the writing, the art for the recent two-parter was decidedly subpar. I was excited for this one, though! Cary Nord is back, and I was curious to see how things would look as he tries to adapt to a bi-weekly schedule. The first attempt went south on him pretty quick. And the results are fine, I guess. Nord’s Wonder Woman is still a bit scrawny and inconsistent. I don’t think he’s quite got a handle on the character yet. At times, it feels like he’s trying to channel Frank Miller (not a compliment). And other times, it feels like a cartoon, but one of the cool new ones, like She-Ra (this one’s a compliment). I don’t know if it’s the hasty schedule or Wonder Woman herself, but I came away from the issue thinking that Nord’s art was okay but that he might not be the right fit for this book. I am about to tell you everything that happened in this comic! But you should read it, even though I’m down on the art! The writing is really good! Whatever’s happened to Olympus and the divine realm continues to have reverberations on Earth, and this time quite literally so. Two giant rock monster titans duke it out in the Rockies, causing all manner of concussive destruction. And of course Wonder Woman arrives on the scene to sort it out, thanks to our mythological creature friends who have relocated to the wilderness. I’m glad to have Cadmus, Damon, and Eirene back in the mix. A little comic relief is always welcome, plus I just like them. G. Willow Wilson’s done a nice job integrating them into the series and giving them distinct personalities, allowing them to be an amusing diversion while also key to the larger plot. Now, titans are very, very big. And Wonder Woman, while quite powerful, is very small, relatively speaking. No matter her strength, the mass just isn’t there to make her effective against towering rock monsters. The physics doesn’t work. Luckily, she’s got a friend. Or rather, not a friend at all, as Giganta makes quite clear. But she knows a gal, and she gets Giganta out of prison to help with the fight. I love this relationship already. 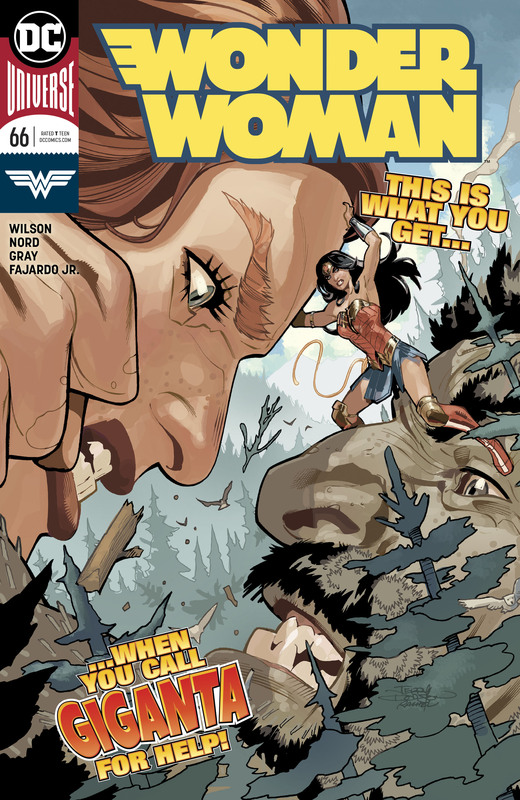 Wonder Woman’s got a history with Giganta, though not as much in this current continuity. Gail Simone wrote some good stuff with her and Wonder Woman back in the day if I’m recalling correctly, but the universe has been rebooted since then. Here, Giganta is leery of Wonder Woman, fearing that her entire plan is “some kind of earnest, dewy-eyed trick to get us to become best friends.” And honestly? Fair enough. That’s totally the sort of move that Diana would pull. She swears she’s not, and that she just needs Giganta’s help to bust up the titans. And I believe her! She’s Wonder Woman. She’s not going to lie. Actually, let me amend that. I believe that Diana believes this isn’t some friend making scheme and that the mission is all that matters. But deep down, maybe so deep that she doesn’t even realize it, she wants to make friends with Giganta. It’s just in her nature. First off, she loves being pals with awesome, powerful ladies. And second, she loves getting to know a villain and helping them find a better path. Especially female villains. She totally wants to be besties with Giganta. She just hasn’t realized it. And once Wonder Woman admits her general exasperation with her circumstances, not just the titans but EVERYTHING that’s going on in her life right now, Giganta decides to help. Because friendship?! Not quite yet, probably, but it’s totally on the way. And I look forward to watching it develop. These two are a fun pair. And now they’re on a road trip to track down more rock monsters. That’s just a recipe for enjoyable, relationship building hijinks. So yeah, the story is a dang delight. I loved the writing in this issue. The artwork is just, I don’t know. It’s not objectively bad or anything. Nord and Mick Gray are telling the story in a clear, readable way. It’s just not enhancing the story, or showcasing it in a compelling way. It doesn’t capture the heart of it all, both in terms of the action and fun but also with emotion. Like when Diana admits to Giganta that she’s feeling a bit overwhelmed, Nord and Gray have her in silhouette. We can get the emotion from the text, because it’s well written, but the art isn’t conveying it. The pictures aren’t complementing the words, basically. They’re not bringing things down, but they’re not working together as well as this excellent writing deserves. We have lots to look forward to nonetheless. Rock punching. Road tripping. Friendship! It’s going to be a good time. Whenever Wonder Woman teams up with another rad lady, even if she’s a villain, you know it’s going to be fun. I’m a day late on this review after being out and about yesterday, but I’ll be honest with you all and admit I wasn’t hugely looking forward to this issue regardless. The art two weeks back was pretty rough, with Jesus Merino and Andy Owens giving me a distinctly mid-90s vibe, and they’re back for this outing as well. Predictably, things look the same. As much as I’m enjoying G. Willow Wilson’s writing, this throwback art is bringing me down. Look away if you have not read this comic yet! I am about to delve into its various plot points! I don’t want to keep harping on the art for too long, but I’m struck by the juxtaposition this series presents. Months back, when James Robinson was writing the book and it was a tough slog to read, there were some good artists that made the book enjoyable. As much as I hated the story, at least when Emanuela Lupacchino or Stephen Segovia was drawing the pictures there was something interesting to focus on and engage with. I could skim the terrible text and enjoy the artwork. Comics are a visual medium after all. Good art can make up for bad writing, at least to some degree. However, it doesn’t work as well the other way. Wilson’s writing is solid, but instead of soaring above the poor art, the artwork drags it down. Emotional beats that should read well suddenly fall flat when the text is next to artwork that’s not conveying that emotion well. Action that should be exciting becomes boring when poorly executed by the artist. There’s a panel in this issue where Wonder Woman, upset over the revelation that the Amazons could be gone forever, flies through the rain weeping. It’s not the most original idea, but there are ways to make it work. As executed, though, it’s almost laughable. The pained expression on her face borders on the ridiculous. The pose, with her fists clenched, doesn’t help matters. Plus her body is positioned in such a way that we’re looking down her chest and thus her breasts dominate the frame. It’s just poorly done on every level, and there are so many other panels throughout the issue that are in the same boat. Aphrodite’s weird throwback bikini, for example, which seems to aim for titillation and lands on boring when neither choice would be ideal. Or Veronica Cale, angrily pointing at Diana in a pose that is the epitome of cliché. Or everything about Nemesis’ design. It’s just a rough outing the whole way through that distracts from what is an interesting story. So let’s get into that story. 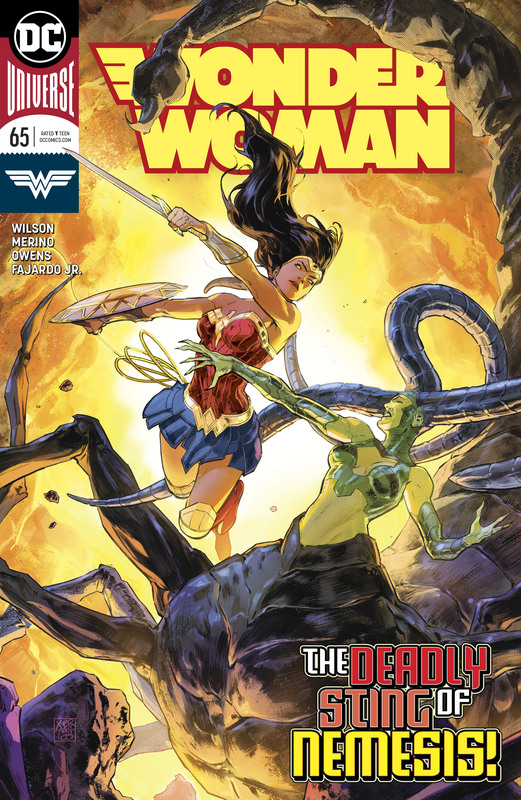 Wonder Woman starts out the issue pretty down, what with Cale suing her and the Amazons perhaps gone, but after a bit of a pep talk from Aphrodite she takes off to confront Nemesis. That’s where we get the twist! Veronica Cale isn’t controlling Nemesis. Nemesis is controlling Veronica Cale! The weird angry venom angle wasn’t my favourite, but I did like the turn as a whole. I’ll admit I’ve got a bit of a soft spot for Veronica Cale. I mean, yeah, she’s pretty much evil on the best of days. But she lost her daughter to some jerk gods and she’s got a right to be upset with anything associated with the divine. I also like a conflict that resolves in a hug. Sure, a big old brawl is a good time, but with Wonder Woman specifically I’m always happy when she can end a conflict in a kind, loving way. The fact of the matter is, Diana’s got a soft spot for Veronica Cale too. She doesn’t want to fight her. And a story in which Wonder Woman shakes off the effects of a nefarious venom AND breaks that venom’s hold on someone else through sheer love is the sort of Wonder Woman story I am all about. Wilson wrote the scene beautifully, too. It could have easily been corny, and the lack of subtlety in the art was no help, but the strength of the writing makes it work. It’s a lovely scene that ties well into the larger history that these characters share. With Cale and Nemesis sorted, the issue ends with the set up for what comes next: The search for Aphrodite’s child, Atlantiades! First off, great name. That’s super fun to say. Give it a try at home: at-lan-tie-ah-dees. Ancient Greek names are a good time. Second, it looks like we’re going to have a non-binary character in Wonder Woman shortly. Aphrodite refers to Atlantiades as them, a gender neutral pronoun, and that checks out mythologically. As the comic points out, Atlantiades is also known as Hermaphroditus, from which we get the term hermaphrodite. Atlantiades was born male, but then the female nymph Salmacis fell in love with him and they were united together by the gods in one body, male AND female, forever. I’m curious to see how Wilson rolls with this all, merging this ancient story with the language and growing understanding we have today about non-binary gender identity. I trust she’ll handle it well. Also, the design could be fun. Atlantiades is traditionally an androgynous character, with much of the artwork of them reflecting that, and I hope the comic book design comes up with a cool way to incorporate that. I’m excited to see where it all goes in the weeks to come!